The Ports and Terminal Insight is a new quarterly report (in PDF format) covering the very latest developments in the container ports and terminals market. It looks behind the data and topical issues to answer both the ’cause’ and ’effect’ questions that matter most to senior industry stakeholders. Is the terminal industry surviving the "perfect storm"? Where have all the greenfields gone? Terminal alliances on the rise? Bespoke global port connectivity ranking index and league tables of the ports that have won and lost the most services each quarter. Analysis of liner service and port call trends. A detailed focus on a spotlight market location and what this means for ports concerned*. Analysis of quarterly container port throughput trends on a region by region basis, showing the key winning and losing ports (and reasons for wins/losses). Drewry global and regional container port throughput indices and rolling annual average global port volume growth. Provision of quarterly throughput volumes covering around 250 ports globally (in Excel format). Summary and explanation of selected new port projects and concessions. Analysis showing the implications of each project on competing ports and the market. Commentary on what each project means and how feasible it is. Projects analysed include Lamu (Kenya), Kyauk Pyu (Myanmar), Nador (Morocco), Banana (DR Congo), Chabahar (Iran), Ibom (Nigeria), Derince (Turkey), Gdansk/Gdynia (Poland), Suape (Brazil) and Newcastle (Australia). Each quarterly PDF report is accompanied by an Excel workbook containing quarterly throughput volumes covering around 250 ports globally as well as tables summarising the data shown in report tables and charts. 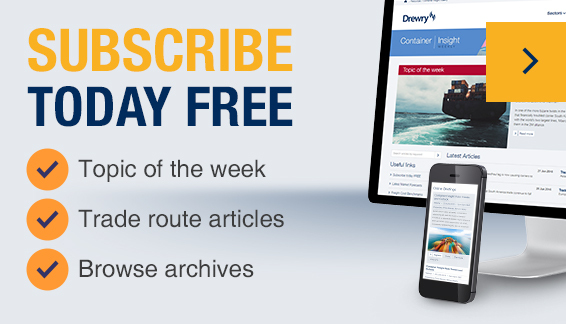 * Each quarter, Drewry scans its proprietary database of liner services and selects a location or trade route that has seen the most significant changes in service patterns, vessel deployments and ports of call.